A standing-room-only crowd in the arena and milions of fans watching at home on television await the opening bell. The spotlight shines on the center of the ring where, in just a few moments, you and your opponent will be engaged in the most grueling competition in the sporting world. You are one of 10 awesome grapplers, the cream of the crop of the World Wrestling Federation. You will be wrestling not only to achieve victory, but to maintain personal pride. You know you have the skills to overcome your opponent and you have the determinationto do whatever is necessary to get the job done. There's the bell! The crowd is roaring! Your adrenalin is pumping! Match time is here! Charge into that ring and prove to the world what you already know in your heart...that you ARE the very best in the WWF! --From the SNES WWF Super Wrestlemania instruction manual. Wrestling is, by many people, the sport of kings. 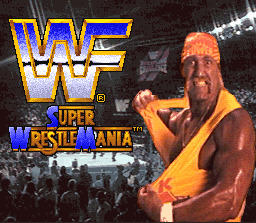 In this game, you get to tangle with some of the greatest grapplers of the 90's, like Hulk Hogan, Undertaker, Randy Savage and many others! The object here is simple: defeat your opponent(s). In order to do so, you must weaken your enemy with suplexes, body slams, and other moves. There are three game modes: One-On-One, where you and one opponent duke it out, Tag Team, where two teams of two fight off against each other, and Survivor Series, where it's 4-on-4. If someone gets pinned, they are eliminated. After all the people on one team are eliminated, the other team wins. There are 10 wrestlers to choose from: "Macho Man" Randy Savage, Jake "The Snake" Roberts, The Undertaker, Hulk Hogan, Hawk, Earthquake, Animal, Typhoon, Ted DiBiase and Sid Justice.